Chestnut and walnut trees grow only in the area around Sant Julià de Lòria, the lowest settlement. Elsewhere, evergreen oaks still are common. Higher regions and many valleys have pines, firs, and various forms of subalpine and alpine plant life. At the highest altitudes there are no trees, but grass is plentiful during the summer. There are carnations, violets, bellflowers, and daisies, as well as blackberries, wild strawberries, and moss. Although it is today well-known as a popular resort for winter sports enthusiasts there are a variety of habitats within the principality and a range of bird species can be seen including all the mountain specialities found elsewhere in the Pyrenees. 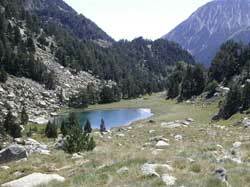 Much of Andorra consists of high mountains with narrow valleys and deep gorges. Broadleaved and coniferous woodland covers large areas, in lower parts there are slopes with Mediterranean scrub and at higher altitude there are many flower-filled alpine meadows.